Game on, breakfast! We’ve been working to perfect our morning smoothies to enhance their nutrition density and help us fuel up for our long runs. By George, I think we’ve got it! This smoothie has the taste and texture of ice cream with just a few healthy ingredients, plus the added benefits of maca powder and chia seeds–two superfoods that help with hydration, stamina and hormonal balance. Did I mention it tastes like ice cream? Yep. For breakfast. Seriously, we eat our smoothies with a spoon, they are so thick and ice cream-y. This is our first attempt at using maca powder as a nutritional supplement. Maca powder is an Incan superfood sourced from a root grown in the Andes mountains of Peru. It is known to be high in calcium, magnesium, iron, vitamin C and vitamins B1, B2, B6 and B12. Maca also contains two essential fatty acids and is very high in fiber. Apparently, maca powder stimulates the endocrine system, which controls hormones, and it is thought to be a good hormone regulator for both men and women. Initial studies indicate that taking regular, small doses of maca powder can help significantly with hot flashes and hormonal fluctuations experienced in early menopause. There are also legendary stories about maca’s effect on the virility of men, but these have not been found to be true in scientific studies. To be eaten, maca powder really needs to be mixed with something. I tried tasting it by itself and…well…it tastes like a dried root would taste. In the smoothies, though, you can’t taste it at all, so that’s an easy solution! I can say that for me, I noticed a substantial increase in energy after my first smoothie with the maca powder. Rather than inheriting some Incan super power, I think I may be low in my B vitamins, but whatever works! I notice that I definitely have more energy in the morning and have cut back my caffeine consumption considerably. Maca is a keeper! I’ve posted about chia seeds before with our chia pudding experiments this summer. Chia seeds are pretty incredible. They have tons of fiber, protein and omega-3s. As a matter of fact, they have the highest level of omega-3 fatty acids of any known plant source. And they absorb up to 10 times their weight in liquid, making them wonderful for folks trying to stay hydrated. I’ve never noticed any immediate improvement in my health or well-being when taking chia seeds, but I definitely feel fuller for longer after eating anything with chia in it. We’re adding chia seeds to our smoothies to add some protein and help us stay hydrated as we add miles to our runs. If you are exercising a great deal, hydration begins before your workout. Like, days before. I’m pretty terrible about remembering to drink water, but I am trying to be more mindful (an alert on my phone helps). And staying hydrated helps keep your skin healthy looking and clear as well! 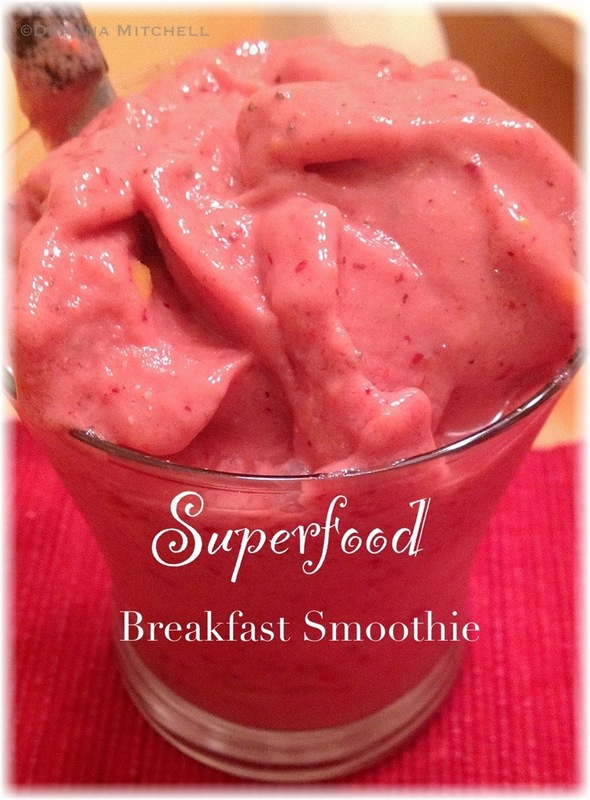 Here is our recipe for Superfood Smoothies. You could easily add spinach, kale or other greens and change it up the way you like! The goal is to use frozen fruit to get that thick, ice cream like texture. The yogurt adds protein and some thickness, which I like, but you could leave it out with no problem. Put all ingredients in a high powered blender (Vitamix or Nutribullet work well). Blend on low, then switch to high until all fruit is pulverized and incorporated and the mixture is thick, like ice cream.